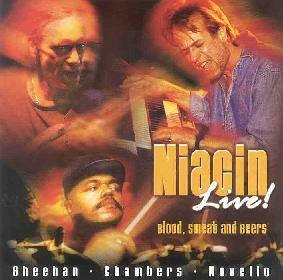 Niacin - "Live! Blood, Sweat and Beers"
So who the hell is Niacin? When you get a CD from the Magna Carta label you know you are in for some serious musicianship and playing. The question is always, is it interesting to listen to and do you want to hear it over and over? Does it offer something original and unique? The band consists of drummer Dennis Chambers, bassist Billy Sheehan and keyboard player John Novello. The band have released one CD previously entitled Time Crunch on the Magna Carta label and five in total. It was reviewed in Aural Innovations issue 19. Anyway, to this CD! It was recorded live in Japan and Indonesia. The opening number is an instrumental that is very funky to start and slowly spreads out into a more jazzy feel before returning the funk. Most of the songs are lead by the great keyboard playing of John. He really reminds me of the good old days of Jon Lord of Deep Purple. These are two guys who know how to play the Hammond B3! The beginning of the CD really sticks to the funk. "The Bullet Train Blues" is really great. "Hell To Pay" is quite a heavy number with the bass very prominent. Tracks like "I Miss You" and "Three Feet Back" show the mellow soulful side of the band. The band even throw in a couple of instrumental cover songs like "Purple Rain" by Prince and the classic, "You Keep Me Hangin' On". Overall, an excellent live funky show! The CD closes with two brand new studio tracks. The first, "Front And Center". you would never know was not from the live concert if it were not for the lack of audience. The same high quality sound and production quality is preserved. Quite a cool jam in the middle of this song. "Gelation" closes the CD. A more laid back song, not as intense as "Front And Center". While I am a man that is really into guitars and bands that don't have them often leave me feeling a little empty, these guys can really lay down the stuff. Check them out, especially if they come to town. Visit Billy Sheehan's web site at: http://www.billysheehan.com. Visit John Novello's web site at: http://www.keysnovello.com.